Rice noodles in a chicken and mushroom flavour sauce mix. 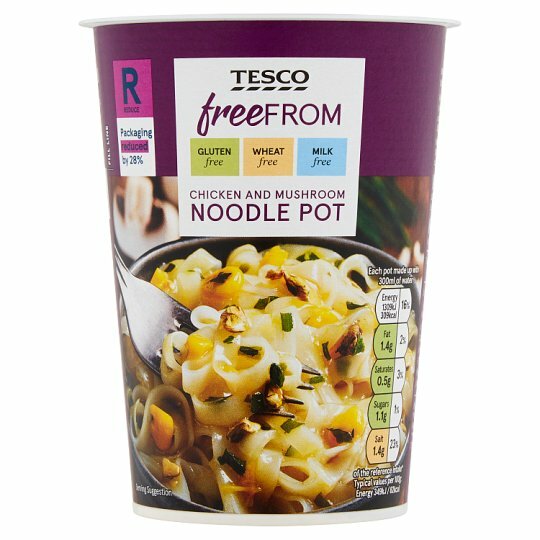 INGREDIENTS: Rice Noodles (66%) [Rice Flour, Tapioca Starch], Maltodextrin, Potato Starch, Flavourings, Sweetcorn, Chicken (0.9%), Onion Powder, Mushroom, Garlic Powder, Mushroom Extract Powder, Chives, Colour (Curcumin), Ground Black Pepper. Empty the contents of the seasoning sachet over the noodle block. Add boiling water up to the fill line (approximately 300ml) and stir. Replace lid onto the pot and leave to stand for 4 minutes. Stir well to separate the noodles and enjoy!